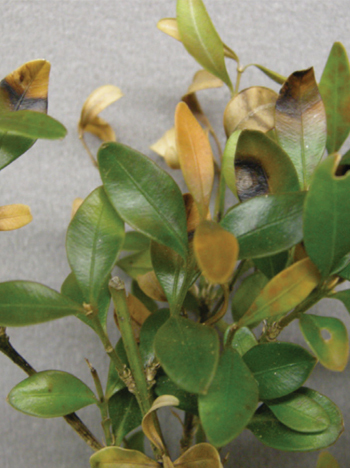 Boxwood Blight is a serious fungal disease of boxwood that results in defoliation and decline of susceptible boxwood. The disease was first identified in New Jersey in 2013. This is a persistent, destructive fungus that can quickly cause severe damage to one of the most common species of residential and commercial landscape plants. Can I Spray To Prevent or Control It? Caused by the fungus Calonectria pseudonaviculata (https://nt.ars-grin.gov/taxadescriptions/factsheets/index.cfm?thisapp=Cylindrocladiumbuxicola). Common in England for 20 years it was first identified in the United States in 2011 and has now been found in 23 states. It affects boxwood, pachysandra and sarcococca varieties. It is a fungus that requires warm moist weather to grow and infect plants. It lies dormant until temperatures reach 68 degrees or warmer, with high humidity, for several days. If these conditions are met it springs to life aggressively. Optimum growth occurs at 77 degrees. This disease becomes active in our area (Central New Jersey) in late May through late September if the right weather conditions are present. The disease can advance very rapidly through a plant. If the proper conditions persist the plant can go from infection to defoliation in as little as 1 week. The fungus starts slowing it’s growth at 80+ degrees, and dies when temperatures hit 87+ degrees or higher. However, ample spores left behind survive and mean a new generation of the fungus can quickly spring to life. Eliminating the fungus in infected plants is not possible, control in the soil is extremely difficult. This is a persistent, destructive fungus that can quickly cause severe damage to one of the most common species of residential and commercial landscape plants. Leaf damage shows characteristic lesions. a few inches.This is why hedge plantings/group plantings of Boxwoodareparticularly susceptible to quick and widespread damage). Longer distance spread is thought to occur through the activities of humans (e.g., contaminated boots, clothing, and equipment), animals, and birds, since the spores are sticky”. The regular activity of a landscape crew not only within a single property, but through an entire day, week andbeyond can impact the spread of this disease. One article pleaded that infected plants not be transported in the back of a truck unless they are bagged, for fear of wide spread dispersal of infecting spores. We suggest contractors think about these transmission issues. 1) If we have a suspected case of Boxwood Blight do we have a plan? 2) Do we spray with fungicides before removing all or part of the plant and all leaf debris? After? disease not only on this property but at properties later in the day or week? etc. can all disperse spores. understand the importance of spraying tools, gloves, shoes, etc. within a jobsite and before leaving? 4) Can I Spray To Prevent It Or Control It? From our research, we believe the answer is a qualified Yes, but it is not 100% certain that even a perfectly executed spray program will prevent all infections. However, if you have a boxwood situation that is critical to a landscape and want to do your best to avoid infection, spraying could help. 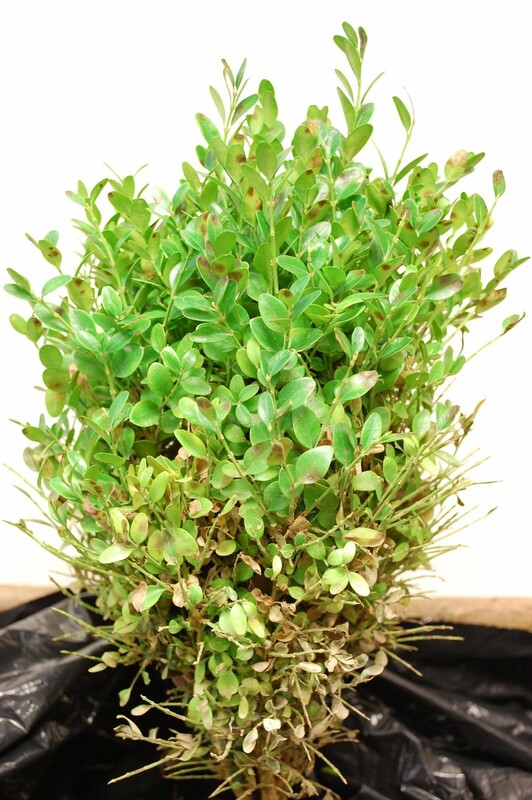 Keep in mind that any spray program calls for repeated fungicide applications (7 to 14-day intervals, according to product label) to susceptible boxwood throughout the growing season for the life of the boxwood plants. Research on this issue produced an incomplete picture but some trends were clear. 1) Fungicides cannot eradicate the disease from infected plants. 2) Once the disease is on a property, even a perfectly executed fungicide spray program may not halt progression of the disease. “You should apply fungicides when temperatures exceed 60°F and rainfall is expected. • There is no cure for infected plants. The fungus cannot be eliminated from the plant, leaf droppings, mulch and soil. plants can regrow to some degree. For example, damage may be in parts of a hedgerow, not every plant. Boxwood planting, preservation of damaged plant(s) may be a consideration. A) Be aware that removing diseased boxwood and leaf debris will not eradicate the boxwood blight pathogen from the location, since the pathogen produces long-lived survival structures that can persist in the soil for 5 to 6 years, possibly longer. B) Remove diseased boxwood and leaf litter promptly. 1) It is best to do cleanup on sunny dry days when sporulation is lessened. Consider using fungicides in advance of cleanup(spray in and around plant(s) to be removed). 2) Remove the plant top/foliage first while taking care not to spread leaf litter. If possible place a garbage bag over the plant prior to removal. 3) Remove leaf litter from soil surface by vacuuming, raking, or sweeping. If leaf debris has been incorporated into the soil, removing soil to a depth of 8” to 12” may help eliminate fungal inoculum of the pathogen. Diseased boxwood, leaf debris, and soil should be double bagged and removed to the landfill OR buried 2’ deep in soil away from boxwood plantings. Burning woody stems can also destroy the fungus, but may be illegal. the ground underneath the plant). 4) Some recommendations suggest removing all similar boxwood species within 10 feet of the infected plant, to reduce the chance of spreading to a much larger area. 5) Fungal spores will stick to tools, equipment, etc., sanitize all tools, equipment tarps, shoes, gloves, etc., used after removing plants to prevent spread of fungal inoculum to healthy boxwood. Use a 5% bleach solution or other recommended disinfectant (pour 1 part 5% liquid bleach and 9 parts water into a bucket or sprayer) to treat tools and equipment. To avoid bleaching-out clothes or shoes consider Lysol concentrate (O-Benzyl-P-Chorophenol), Lysol spray (Ethanol), or Zerotol (Hydrogen Dioxide). 6) Dispose of bags in a landfill or bury 2’ deep. 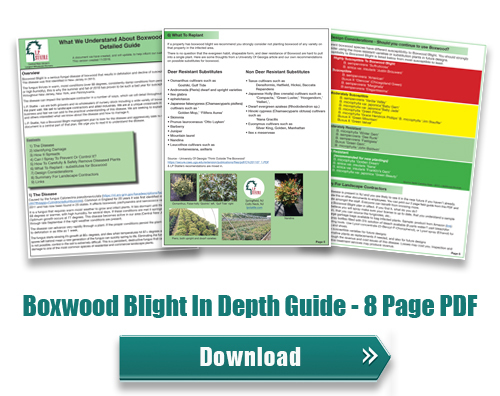 Sources Virginia Cooperative Extension – Best Management Practices for Boxwood Blight in the Virginia Home Landscape https://pubs.ext.vt.edu/content/dam/pubs_ext_vt_edu/PPWS/PPWS-29/PPWS-29-pdf.pdf , Assorted other sources. 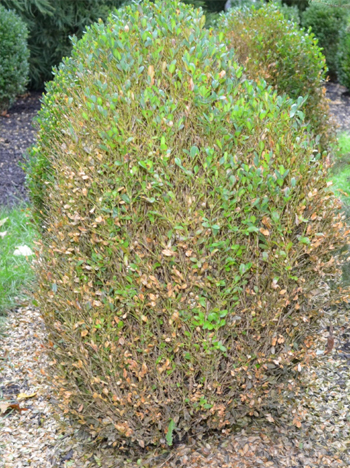 If a property has boxwood blight we recommend you strongly consider not planting boxwood of any variety on that property in the infected area. There is no question that the evergreen habit, shapeable form, and deer resistance of Boxwood are hard to pull into a single plant. Here are some thoughts from a University Of Georgia article and our own recommendations on possible substitutes for boxwood. 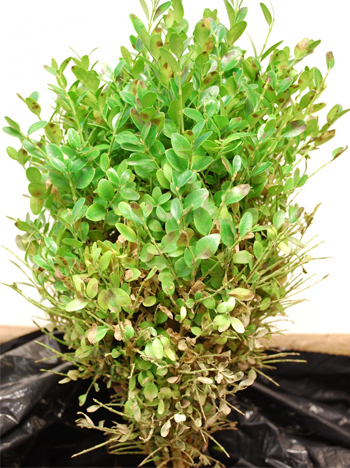 Different boxwood species have different susceptibility to Boxwood Blight. You should strongly consider using the more resistant varieties or substitution plants in future designs. Susceptibility to Boxwood Blight is listed below from most susceptible to least. 1) The disease is present in NJ and you are likely to see it in the near future if you haven’t already. 2) Circulate this or other documents to employees. You can print our 2 page field guide from this PDF and circulate amongst the staff. Everyone can benefit from knowing more. 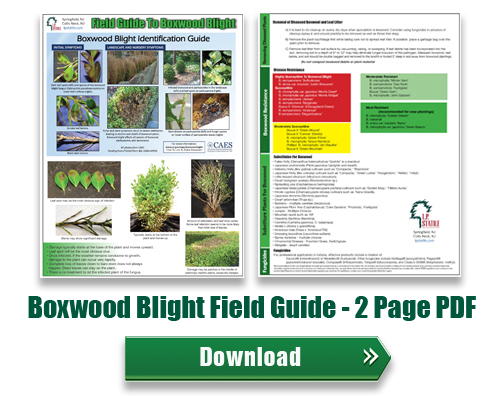 3) Have a Boxwood Blight plan in effect. If you find it, what do you do? 4) If you believe you will spray make sure your license is up to date, that you understand a sample program, that you can source the fungicides, etc..
6) Have spray bottles filled with 5% solution of bleach available (9 parts water/1 part bleach) for disinfecting tools. 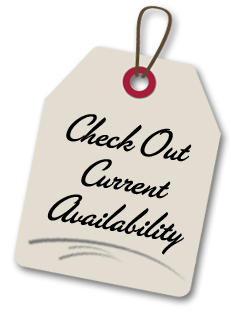 Use Lysol concentrate (O-Benzyl-P-Chorophenol), or Lysol spray (Ethanol) for clothing and shoes. 9) Think through the revenue and cost issues of this disease. Losses may cost you. Inspection and preventative treatment services may produce revenue. 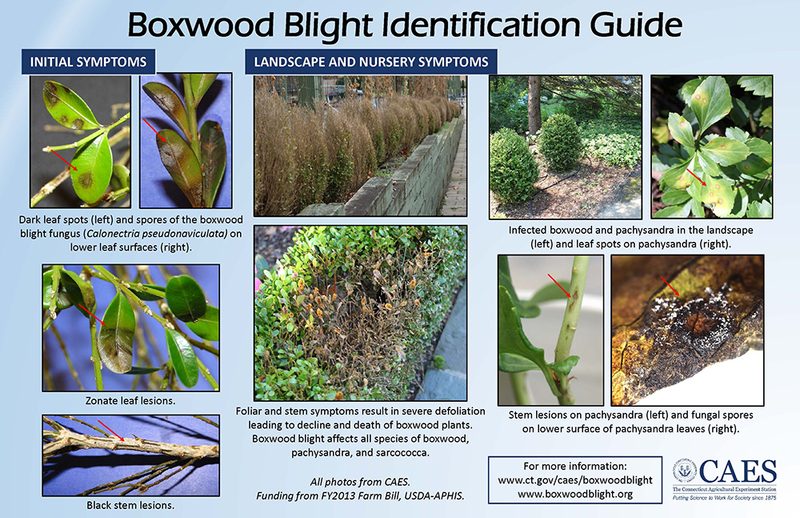 US National Library of Medicine – Boxwood blight: an ongoing threat to ornamental and native boxwood. A good science article with deep links to current research.